Open a newspaper, flip on the TV, or visit the website of a news network, and the headlines are clear—something has gone terribly wrong. Each medium testifies to the reality that our world is marked by immense tragedy. The truth is that the headlines of our lives are not much different from that of the news. We all live lives amongst the chaos that permeates through the torn fabric of the cosmos. If we are honest and pay attention, we can feel our hearts groan along with the creation that has been subject to futility (see Romans 8:18-30). This futility has left humanity searching for a hope to answer the deep questions of the soul. The search of hope takes many people to many different places, but as Christians we testify that there is only one hope that is living. What does this mean for you personally? What season of life do you find yourself in today? Are you on a mountaintop or in the deep recess of a canyon? Life takes us to both sights, but one thing that remains true through it all is that Jesus is Lord. The Apostle Peter witnessed with his own eyes and conversed with the living and resurrected Christ. This reality undergirds Peter as he writes his first letter. 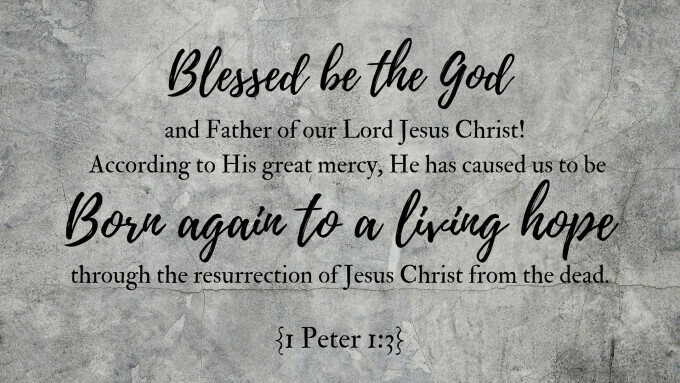 In writing, Peter holds the goal to bring comfort to a church that had found themselves in the throws of the canyon, yet he calls them to “bless” God. This word bless is the same word that we derive our word eulogy from. Peter is calling these first century believers and us today to speak well of and to magnify God. But how exactly are we do do this as we stand in the canyon or on the mountain?